Our medium weight PSM (Plastic Starch Material) biodegradable cutlery is made from non-GMO vegetable starch. 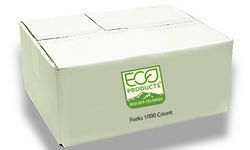 It not only exhibits superior performance over other biodegradable utensils, but is OK Compost certified. These biodegradable utensils break down under commercial composting conditis in about 95 day. 100% degradation occurs over a slightly longer period of time. Our compostable cutlery is an essential for a successful zero-waste wedding or birthday party. Excellent for both hot and cold foods, our utensils are suitable with food up to 220 degrees (F). Previously made from a mixture of potato and corn starch, now it is only made from non-GMO vegetable starch and other biodegradable fillers. ISO certified (worldwide clean manufacturing certification) and FDA approved.